Prussian rabbi; born 1735; died at Danzig Feb. 3, 1807. He was rabbi of the Schottland congregation in Danzig from 1782 till his death. 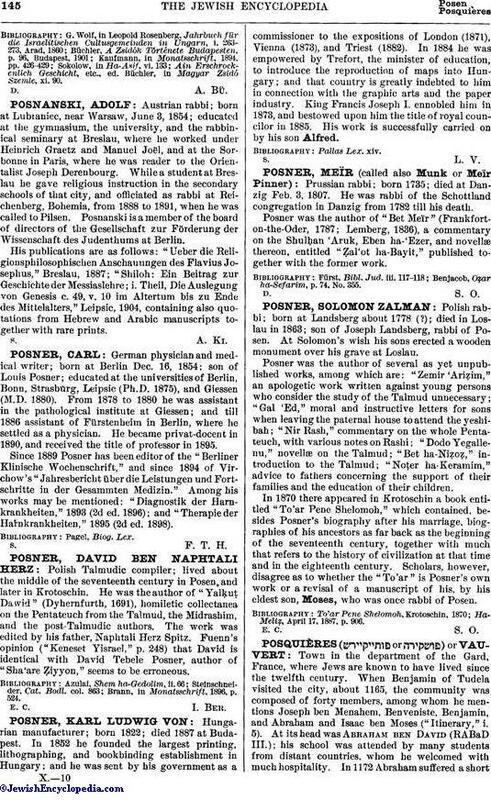 Posner was the author of "Bet Meïr" (Frankfort-on-the-Oder, 1787; Lemberg, 1836), a commentary on the Shulḥan 'Aruk, Eben ha-'Ezer, and novellæ thereon, entitled "Ẓal'ot ha-Bayit," published together with the former work. Benjacob, Oẓar ha-Sefarim, p. 74, No. 355.